Ok I am working on redstone and apatite, hopefully ill have one to show you today. the redstone I do like, however I made it using a small texture and I think I want a more realistic looking red stone, and the texture for apatite might work for nikolite, we will see. 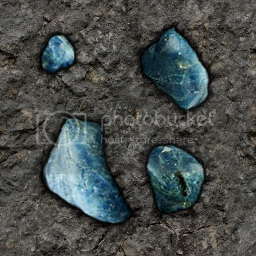 Muahahaha apatite and I like these 8 random textures. Now as for the redstone, might have what I want but we will see when I make them. I love what you are doing for the ores, but I wouldn't mind seeing what you have in store for the other textures. I love the apatite, coal is looking great! But you almost made me think that the coal texture was tungsten. Did you get the apatite texture of this image, -snipe- Just wondering? Nope, however that's not to bad of a picture, I am not just taking the real ores, I am trying to match the closest looking ore to the original color of the mod, its like apatite there are more then one color, and green I could have gone, however that's not going to match the original blue texture. Now I know coal could be mistaken for tungsten, however I think I have a plan for that and you will be able to tell them apart. If not ill slightly change one of them in shade of black, maybe make the coal a bit lighter in black and more really dark grey. Its kind of similar to minecraft now, tungsten can be mistaken for coal. Well as I said on the main post, I want to focus on the ores and I don't really want to make textures for specific things, I like the ones I use from other HD texture packs. Like cobblestone for instance, I found one that looked pretty good, then I slightly changed it to kind of have my stone behind it, however its not mine someone else made it I just like it better then any cobblestone I've used. LB Photo Realism RPG those trees are perfect to me, I don't want to change them. Now if I don't like something I might change it and maybe I should ask to make a variant of photo realism texture pack? I could use his as a base and change everything that I don't like, basically ask permission to use specific textures from each one that I have already done for personal use? Maybe we will see. but here is Red Power 2 Marble and the bricks to match and basalt. This I did along time ago, and again its the same I just mess around with other pictures. I just find pictures and edit them until I like the looks in game, I don't want to make a full texture pack or textures for everything unless I did not like something else out there. The ores I've always disliked in most texture packs, except mine. And for red power 2 there were no HD texture packs for realism for it, so I made some. Same for the flower, basalt cobblestone(mines hideous but its 256 lol), rubber tree, and ill eventually start working on machines, because gregtech needs some love... lol it gets way to much hate haha. and I find apatite! Lucky. As well as the new coal texture! 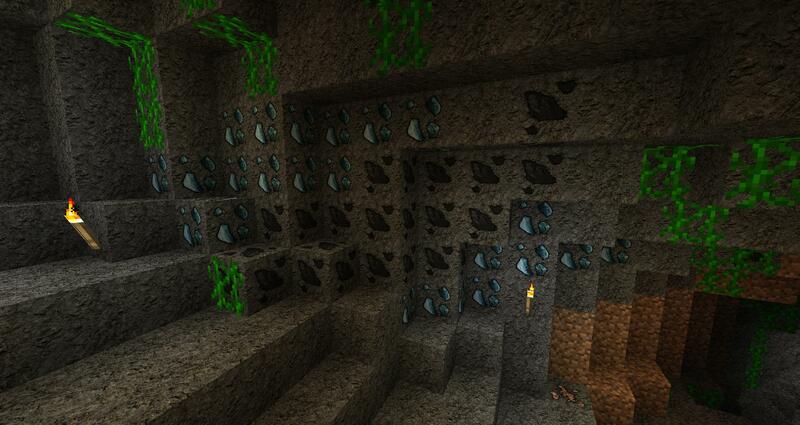 Thanks for greyjust for posting these awesome ores! I'm thinking about making a video of my textures in game, and will make new video's showing the complete random texture sets as I complete them. This is the most beautiful thing I have ever seen. I rate your wonderful ores as 13/10. I want this with great urgency and devotion. and with the random textures, it wont look so repetitive. You need to do grass, dirt and gravel to make minecraft look more 'real'. Plus cobblestone. Hey what happens when you make a font after a disney princess? As i said i don't know if i want to or even be able to compare to some of the grass textures i like from other photo realism packs. I might give it a go but there again I'm an ore fan. Ok so I have finished the full 8 random for apatite, I like them a lot so far, I need to see them in game now. Redstone and Nikolite I think are going to be the hardest ones, they are similar in function and so I think they will have similar looking textures just red and bluish color respectively. And I am going to setup my 1.4.7 server for myself and I will be making a video on the full random textures, as the ctm and the simple texture sheets instead of 1 block texture per .png. Makes it simpler plus the major mods have not updated. Thanks, and don't get me wrong but I am not trying to make a full texture pack, I don't want to change specific textures, my ores are enough to make my texture pack add on unique. There are still textures I'm going to change however some there is no need, you cant compare with them they are in my opinion perfect hd textures. Basically an add on, they would have to change bedrock, stone, ores, , ill be doing redstone dust and all redstone related textures because I want all of rp2 to match, wool might be changed to Psientists wool because that wool is by far my favorite, I also want to mess around with the breaking animation, so it turns out quite a bit to change. This will require people to change a lot on the textures, and I know it would be easier just to download it already put together texture pack, however the textures I really like are the LB realism so I figured Id ask. well thats right if you ask a no you can expect a yes you can get or was it in the other order? anyway you know what i mean right. I want all the clay colors to match all the wool colors closely, they look funny to me otherwise, and yes there will be blue not that shade purple that is suppose to be blue I know what you mean there. I am sorry to bring in one of my pet peeves, but copper ore is green or turquoise in color. Haven't you ever seen a very badly corroded penny? I've actually tried this on a ftb server. The ores match the atmosphere perfectly! Just more ores = less minecraft, more real! Yup however, as I said before I don't just want to make realistic ores, but I also want to match the colors that the original mod has. 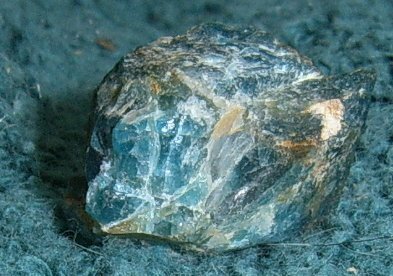 Apatite goes green/yellow and other, copper is no where near the smelted copper, silver you can't tell its silver ore.
Tell me, when in minecraft looking for copper, are you going for green/turquoise color?. But that's not what I'm going for, I want to match the original colors of the mod, and just give them HD textures for the ores, weather they are the actual ore or not. Currently I am having issues with the CTM for metadata ores. Like Nikolite, its easy to change the texture but for random ores, its just making the block invisible. Reasons I think the minecraft 1.5 or 1.6 texture setups will allow the random better then 1.4.7 what I am currently working with. So I will be making the single texture for each ore and will later add in a random for them.